I surpassed the $10000 mark in fundraising today. It's been more than a year since I started considering joining up with this crazy bike ride and it's been more than 11 months since I really caught hold of what a crazy idea it was to go out and seek support for something I was going to try and do to the tune of $10k. Wrapping my head around the idea of that sum took a solid 2 months, I kept thinking I need to find 20 crazy people who each have $500 or I need to find 200 people who each have $50 and convince them that this bike ride is a worthy cause for them to jump onboard with. Well, I wasn't about to make either situation happen, neither was really feasible. My mindset shifted early in the fall of 2007, I was going to get as many people to understand the reason that this was happening as I possibly could. I was going to make sure I wouldn't close the doors on any demographic, not the ones who could cut a $20 cheque and most certainly not the ones who could cut a $1000 cheque. It was then out of my hands how things tallied up and I'd have to keep talking, keep checking my email,keep smiling and keep trusting that this ludicrous idea was going to turn out for the good. Well, there have certainly been more than 45 conversations had about SeatoSea over the course of the past year. There have definitely been more than 450 conversations, easily triple or quadruple that... but to date there have been 45 individuals who have decided to get on board and take a stand against the perpetuating cycles of poverty in our world. 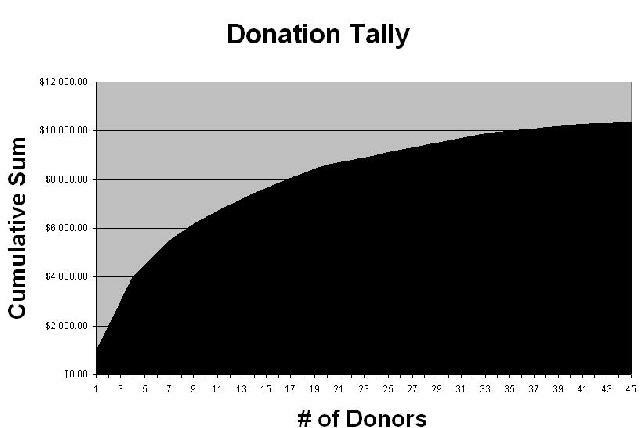 Each donation counts, while my own $10000 target isn't really a measure of the kind of commitment it takes to alter the patterns we see around us the means by which I got there does give insight into the solution. I sorted the donations from large to small and added them up, click on the thumbnail to see what that looks like. While 6 chunks of money got me half way, it was also really due to many of the smaller donations that things didn't stop halfway. The smaller bits add up and do make the difference. When considering the magnitude of the challenges of poverty out there, some really sweeping political or economic reforms can make a huge difference. The "Sea-to-Sea Bike-Tour" sized contributions towards changing the world also make a difference, and it's also the small steps that we make in our own lives, in our cities and communities that make a difference. While the end of cycling preparation occurs at some point this week for me and I begin biking the physical aspect of this challenge takes a bit of a turn. The optional aspect if riding my bike (how far, in what weather etc. etc.) shifts to a bit more of an exam. I don't dictate very many options anymore, and that's intimidating, I'm waking up a riding a bike regardless of whether or not my body thinks that is a first choice for the morning. The shift from choice to not-choice isn't mirrored in the other "world" of the trip. Throwing my weight into the fundraising aspect of the ride for the past year has been a non-option. Now as things get underway on the bike the effort level as it relates to the purpose of the bike ride is in some sense more optional. As part of the commissioning at River Park Church this morning Pastor Mike requested me to declare my intent ... "to trust God to protect and use you" ... and my response was positive. The tour's purpose includes raising awareness across the nation of poverty related issues alongside the fundraising. Making those conversations happen in highway rest-stops, coffee shops, campgrounds, community centers and probably more than one ice cream shop is just as crucial now as the push to $10000 has been for the past 11 months. So, when I don't particularly feel like getting on a bike on any particular morning I guess I just need to remind myself that I do still have an option and a choice for the day. I'm biking whether I like it or not, but I can each day choose to make the positive action towards awareness and change.